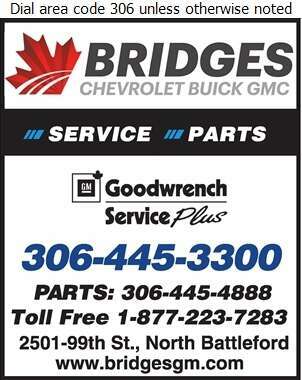 Bridges Chev Buick GMC is a full service automotive dealership located in North Battleford, SK. Our sales department specializes in new and GM Optimum pre-owned vehicles. We have the number one sales staff in Northwest Saskatchewan with a Finance Department to take care of all your financing needs no matter what your credit situation. Most used vehicles come with a standard 3 month/5,000 KM warranty that includes 24 hour Roadside Assistance and a 30 day exchange privilege. Our friendly staff will take care of all your service and parts needs and are SGI accredited. All of our technicians, service and parts personnel are highly trained and committed to customer excellence. We are open Monday thru Saturday and are equipped to service most domestic and import vehicles.